“A well-known Old Etonian ex-Guards Officer jazz-trumpeter-broadcaster-cartoonist-bandleader-bird-watcher-gastrnome-humourist-panellist-TV-personality.” Who is this? 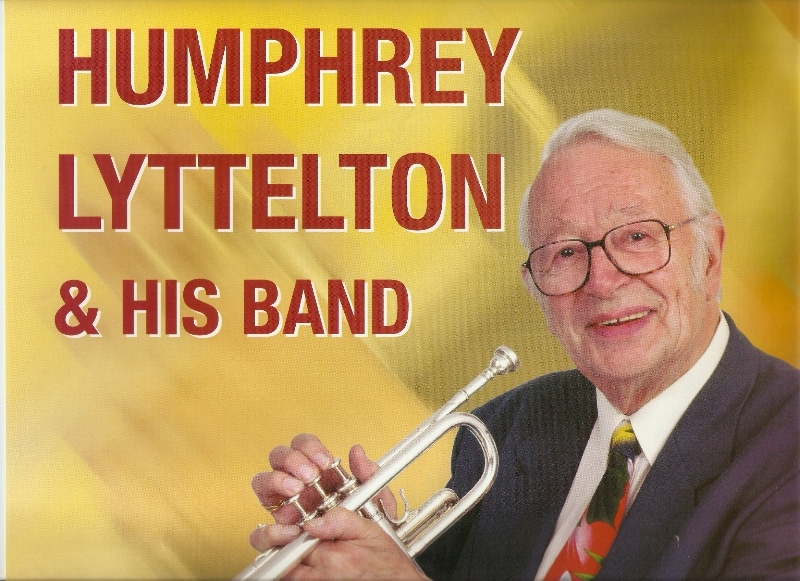 Why Humphrey Lyttelton of course with the words taken from his self-penned comic obituary. To many Humph is associated with a certain radio panel game and many a round of Mornington Crescent is played in his memory. But in this post I’m looking in more detail at Humph’s other radio career: as a jazz broadcaster over five decades. A well-known online encyclopaedia has this to say on Humphrey’s jazz broadcasting career: “From 1967 until April 2007, Lyttelton presented The Best of Jazz on BBC Radio 2, a programme which featured his idiosyncratic mix of top-quality recordings of all ages, including current material”. And that’s it. Shame the dates are wrong too. Humph had discovered jazz when aged 15 he started collecting records by Nat Gonella. But his moment of epiphany was on hearing Louis Armstrong’s Basin Street Blues. (He would go on to present a Radio 2 documentary series, Satchmo, in 1974/5). Soon after he gave up playing the mouth-organ formed his first jazz band and took up the trumpet. His war service saw him serving with the Grenadier Guards and on demob it seemed that a career as a cartoonist rather than full-time jazzman might be on the cards. On the back of the post-war New Orleans jazz revival Humph joined George Webb’s Dixielanders for a few months but by late 1947 he’d left and together with his friend the clarinetist and fellow cartoonist Wally Fawkes he formed his own band in January 1948. They soon became regulars at the newly formed London Jazz Club with a “jazz-for-dancing policy”. 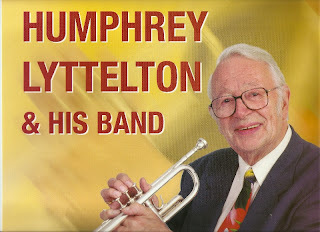 As bandleader Humphrey would, of course, introduce the band and the songs, a task that he’d perform with wit and humour – something I was to witness many years later when I saw the band perform at the Beverley Picture Playhouse. By the late 1950s the BBC was also letting some bandleaders make their own announcements on air and Humph soon became an assured and natural broadcaster. This is an early Radio Times billing from 7 August 1958. Alongside Jazz Club listeners could, in the late 50s also hear Just Jazz with Charles Melville and Steve Race, Jazz Session (1958-64) on the new Network 3 (later Third Network) as well as Ken Sykora’s Guitar Club. In the early 60s we got Jazz Today (Charles Melville again and Alexis Korner) and from 1962 Jazz Scene with Steve Race. 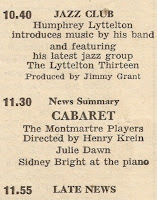 By now the same names were coming up on these various programmes, broadcasters who would be associated with jazz on the BBC for many years and Humphrey was one such name, becoming an occasional and then regular host of Jazz Club from 1964, appearing on its short-lived successor show It’s Jazz and later alternating compering duties on The Jazz Scene with Benny Green. In addition when, in December 1964, the Music Programme (the daytime service of the Third Programme) started to extend broadcasting hours and introduced the Saturday lunchtime Jazz Record Requests it was Humphrey who played the selection of ‘gramophone records’. In the mid-60s there were also occasional forays into television with Jazz 625 and Jazz Goes to College, both produced by Terry Henebery who’d worked on Jazz Club for many years. BBC Radio's jazz offerings in 1966 across all the networks. So Jazz Scene and Jazz Club henceforward go their own separate ways. As compere for both new programmes I’m aware of the apprehension in some quarters about our new Radio 1 environment. After a day of non-stop pop shall we feel like belated guests coming stone-cold sober into a roomful of whooping revellers? Jazz has admittedly grown away from pop to the extent that it is more concerned with enduring quality then fashions or trends. So Jazz Scene must present the vintage stuff as well as the newly pressed. And the great range of British jazz heard in Jazz Club will reflect the traditional as well as the trendy. But jazz is happening now, it’s being talked about now, and it entertains and excites millions of people now. And we shall always keep this in sight. On Jazz Scene, for instance, as well as a half-hour review of new discs and the voices of leading musicians in Hear me Talkin’, we shall have Peter Clayton working as my ‘oppo’ chasing the jazz news right up to the last minute of rehearsal and ready to chip in with the latest happenings at any time during transmission. As for Jazz Club, I can only repeat what I have said before. American artists, reared on a diet of canned, bottled and pickled radio back home, are staggered to find a place where radio broadcast means singing to real live people with a real live atmosphere, and not just talking to a man in a little box about your latest record. On Jazz Club, we don’t call on electronics to whip up an atmosphere. It’s built in – and you can’t get more trendy than that! 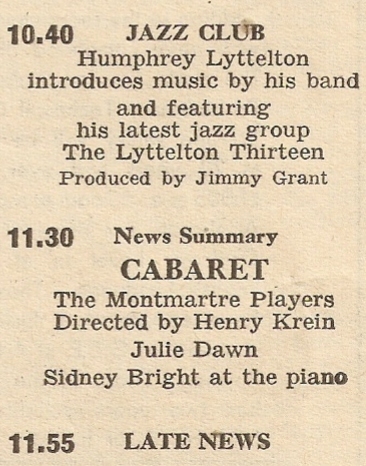 It was all change again in 1968 when The Jazz Scene morphed into The Best of Jazz, the programme for which Humphrey would become best known, panel games aside. Still on Radio 1 late on Sunday night it first aired on 13 October, moving over to Radio 2 in March 1970. From late 1969 The Best of Jazz had an unusual unique existence on three BBC channels. Billed as a Radio 1 show on medium wave it also went out on Radio 2’s long wave and VHF. However, as Radio 2 still wasn’t in stereo you could hear most of it, aside from an extended news bulletin, over on Radio 3’s VHF stereo transmitters. This Sunday night arrangement continued for a couple of years. By the summer of 1973 The Best of Jazz was occupying what would be its most regular place in the schedules on a Monday evening. 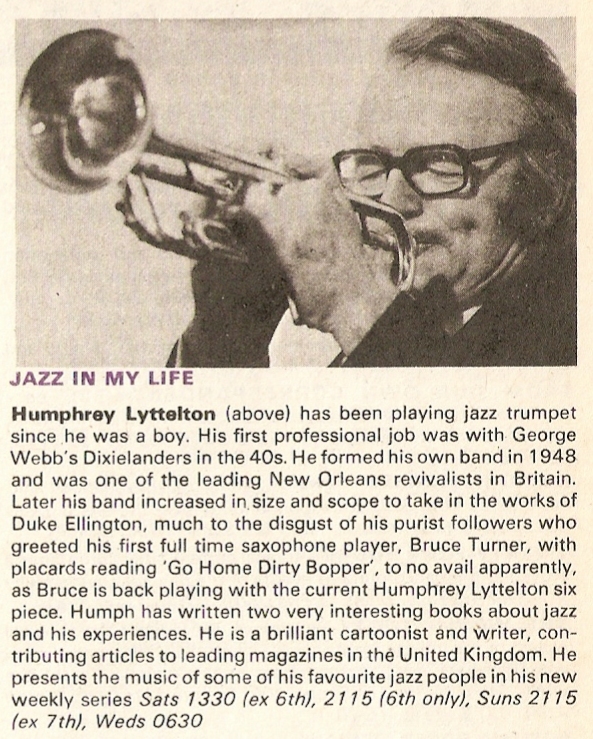 Meanwhile Humphrey was much in demand elsewhere, contributing to radio and TV arts programmes and starting the inevitable round of chat shows, quiz and panel show appearances that would include Sounds Familiar, Quote…Unquote and Jazz Score. Writing in his diary some three years later Humph remembered that “everyone agreed that it was too self-indulgent and dreadful to get off the ground Months later a BBC ‘high-up’ heard the pilot, fell about and insisted it should go on.” Relying on the comic skills of the panel increasingly the real star of Clue was the chairman. He feigned boredom (or was it real?) and sounded if he’d rather be elsewhere. He delivered the scripted game intros with a bewildered air that belied his comedy timing. “He’s the only person I’ve ever known who could get a laugh just with silence”, claimed friend and ISIHAC panellist Barry Cryer. Just over a month later, on 25 April, Humphrey, passed away after post-operative complications. 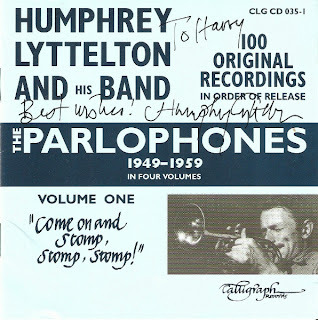 Humph signed this CD cover for my late father-in-law. After Jazz Record Requests (still running on BBC Radio 3) and The Best of Jazz, the longest-running show was Jazz Club. 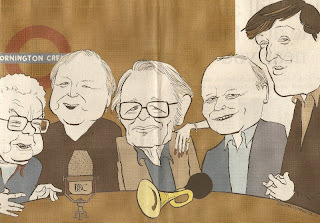 It was first broadcast in the Light Programme on Saturday 15 March 1947 and billed as a “half-hour of music in the jazz idiom played by some of Britain’s leading jazz instrumentalists, coming to you from the heart of London’s West End”. The first presenter was Mark White who would later rise through the ranks of BBC management and is credited, amongst other things, as giving Terry Wogan his BBC break in 1966. Other presenters in the early years included Jack Jackson and Steve Race. 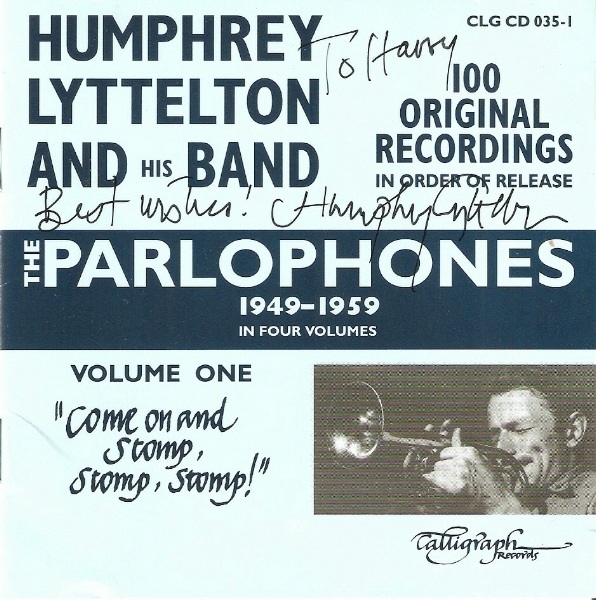 The programme’s theme, composed by Billy Munn, was Jazz Club Stomp. The programme took a break in the early 1950s, replaced by the record show World of Jazz with presenters including Alun Morgan, Denis Preston, Rex Harris, Charles Melville and Kenneth Ashden and session performances in British Jazz with Dill Jones. Jazz Club returned on 3 October 1957 and for this run the presenters included Dill Jones, Tony Hall, Hector Stewart, Alan Dell, George Melly, Diz Disley and Humphrey Lyttelton. It ended on 19 September 1964 only to be revived on Monday 22 March 1965 with Humphrey as the main host through until 26 December. 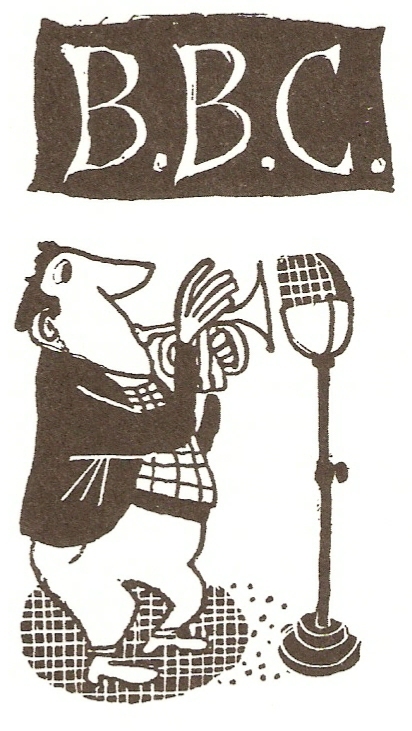 From Sunday 2 January 1966 it becomes part of The Jazz Scene show, with the performance billed as In the Jazz Club. With Humphrey presenting the show again becomes a stand-alone programme on Radio 1 from Wednesday 4 October 1967, later moving to Saturday nights in 1969. Major changes to all networks in April 1970 means Jazz Club is now on Radio 2, initially midweek but then swapping with The Best of Jazz to occupy a Sunday night slot post-midnight after Peter Clayton’s Jazznotes. On 8 April 1973 Sounds of Jazz begins, this time on Radio 1, with Humph looking after the first hour as Jazz Club and Peter Clayton the second hour of jazz records. 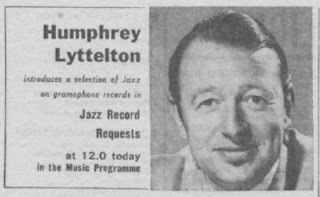 By October 1973 Humphrey no longer looks after proceedings and from 5 January 1975 when Sounds of Jazz moves to Radio 2, Jazz Club finally ends. Jazz Club sessions continued to feature as part of Sounds of Jazz which ran until 1990 and was succeeded by the nightly Jazz Parade. Listeners to Radio Ulster can enjoy their version of Jazz Club every Sunday evening. Is it a collection or am I hoarder? In fact I like to think of my Radio Times archive as a valuable research resource. When packing up to move our worldly possessions from Yorkshire down to France I sold or threw away a whole stack of magazines. 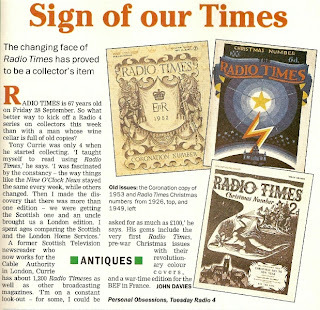 But the Radio Times boxes, they remained untouched, save for some extra parcel tape. They were coming with us. 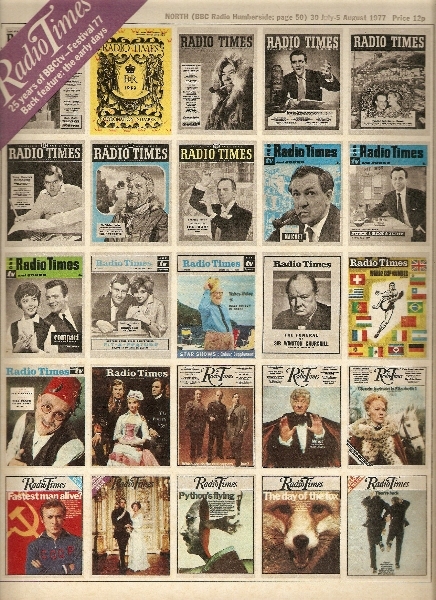 My Radio Times collection dates back from 1976 starting when, aged 14, I kept the family copy rather than let it go into the bin. At the time the magazines were, much to my mum’s annoyance, stored in the bottom of my wardrobe. The run is patchy during 1976 and only complete from Easter 1977, save for those missing editions due to the 1980s print disputes. That’s about 1,800 copies. Recent eBay purchases have supplemented my archive with older editions. But with the BBC’s Genome project perhaps going public later this year will I be ditching the lot? 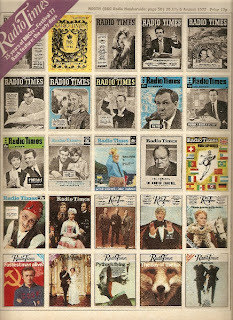 The Genome project scanned all the various editions of the Radio Times back to 1923 to create a fully searchable programme information database, ideal for radio and social historians or just the idly curious alike. At first the project won’t be making the photos, articles, letters, adverts and that classic artwork available online, although the whole of the magazine will have been scanned. Using optical character recognition the software will build up the programme data to populate a screen similar to the existing schedules pages you see on the BBC radio and tv websites. I think I’ll be hanging onto the actual magazines for the moment. Here in France fortunately enough two of the main supermarkets in the nearby town of Parthenay – both Leclerc and Hyper U –stock the Radio Times, appearing on the shelves by the Thursday. So I’m still able to get my weekly fix. The online version just doesn’t do it for me. And if, for some reason, the RT doesn’t get delivered then it’s a quick call to a chum back in the UK. Cheers Phil! 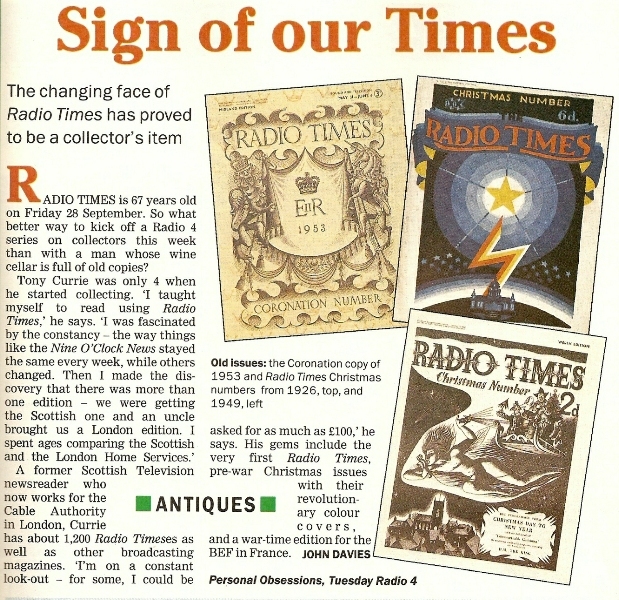 There are plenty of other Radio Times collectors out there. The late Wallace Grevatt probably had the largest private collection and some of his copies were used by the BBC for the Genome Project. Tony Currie talked about his personal obsession on Radio 4 back in 1990 and went on to write a book about the magazine’s history. The Christmas double issues for 1973 and 1974. Remember those Radio Times jingles? “It’s out today….the new Radio Times.” Here’s a sample of the jingles produced by JAM Creative Productions for both Radio 1 and Radio 2. From 1985 this is Mark Page with a Radio 1 promotion as the magazine hits the newsstands. No jingles in this Radio 2 example from 1980, just a bit of over-acting from announcer Paddy O’Byrne. And to show that you can perhaps have just too many issues of this esteemed publication this chap in Channel 4’s Get Your Home In Order had 5,000+ with many multiple copies. Whilst the Churchill funeral issue may not be worth much I did spot an old Dad’s Army one (Clive Dunn on the cover) and at the end of the clip the 1970 Codename issue (featuring Anthony Valentine) is significant as it’s the first week of major radio changes following the Broadcasting in the Seventies review. Let’s hope he just didn’t junk those. 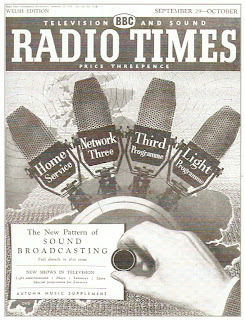 More on the Radio Times this November when it celebrates 90 years of publication. With thanks to Ian Arnold.